Water Gruel. Mix 2 tablespoons of Indian meal with 1 tablespoons wheat flour & sufficient cold water to make a stiff batter. 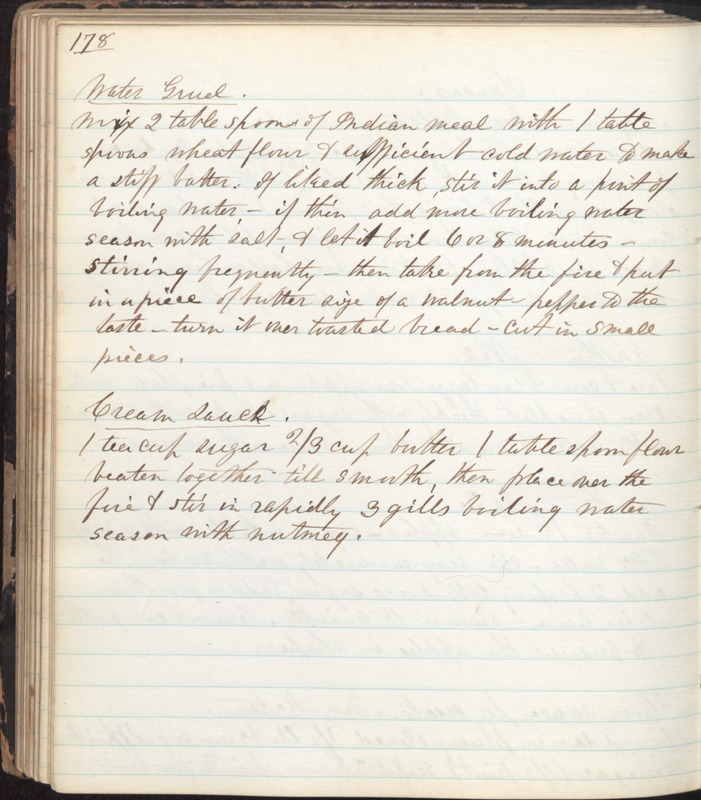 If liked thick, stir it into a pint of boiling water - if thin add more boiling water season with salt, & let it boil 6 or 8 minutes - stirring frequently - then take from the fire & put in a piece of butter size of a walnut - pepper to the taste - turn it over toasted bread - cut in small pieces. Cream Sauce 1 teacup sugar 2/3 cup butter 1 tablespoon flour beaten together till smooth, then place over the fire & stir in rapidly 3 gills boiling water season with nutmeg.